Three strikes and you’re out doesn’t just affect California lawbreakers, but it also applies to Nate Marquardt. Although UFC president Dana White dubbed Marquardt a “sweetheart” for the second time since firing him, White reiterated Thursday the former middleweight top contender’s Octagon days were WITHOUT A DOUBT over. “To me this is his fourth chance. This is a fourth chance,” White flatly stated following today’s UFC 132 pre-fight press conference. “He tested positive before, and then apparently he was on suspension with New Jersey because his levels were high. Then he comes into [Pittsburgh] and doesn’t pass his medicals. 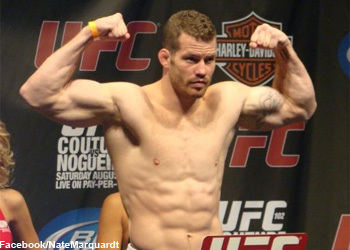 According to Marquardt, his medically prescribed use of testosterone replacement therapy (TRT) is what caused him to register high levels of testosterone prior to this past Saturday’s “UFC on Versus 4” weigh-ins. Because “Nate the Great” has continued to flirt on the higher end of the authorized limits, White believes he may have been using the controversial treatment to gain a competitive advantage. Marquardt was previously banned by Nevada’s governing body after screening positive for high levels of nandrolone, an anabolic steroid, following his decision victory over Ivan Salaverry in his UFC debut in August 2006. He holds an impressive 31-10-2 professional record and is still considered to be one of the world’s top competitors. His manager claims their phone has been ringing off the hook with other promotions throwing offers at the 32-year-old. Unfortunately for Team Marquardt, the world’s premier mixed martial arts show will never again be on the other end of the line. “Nate’s a nice guy, he’s a real sweetheart, humble guy, but the facts are the facts,” said White. “It’s easier to go after a guy like Josh Barnett. You know what I mean? He’s just callous and rude and a d***, so it’s easier when he does it to just go, ‘You know what? (Expletive) Josh Barnett.